Vertically aligned carbon nanotube (CNT) array was synthesized on pristine stainless steel (SS) substrate, chemically etched SS substrate, and Ni/Cr layer coated SS substrate via plasma enhanced chemical vapor deposition method. The effect of chemical etching on the surface morphology of the SS substrates and the growth of the CNTs were investigated. SS substrate chemically etched for 40 min resulted in CNTs with uniform diameter and length. Electron field emission properties of CNT arrays synthesized on pristine SS and Ni/Cr coated SS substrates were measured. 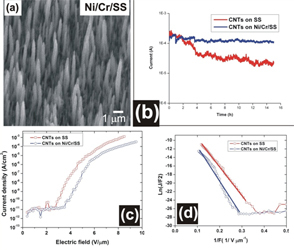 It is found that CNTs synthesized on pristine SS substrate exhibited lower turn-on electric field, lower threshold electric field, and a higher field enhancement factor as compared to that from the CNTs synthesized on Ni/Cr coated SS. However, the CNTs synthesized on Ni/Cr coated SS showed better emission stability, which was attributed to the improved adhesion between the CNTs and SS substrate via the Cr thin layer. The results indicate that the conductive substrate, robust contact between the CNTs and the substrate, and the high stability will benefit the field emission applications of the CNTs.